Solar Pool Installation Company Northern VA, MD, Wash D.C.
How is Solar Pool System Integration Beneficial for Your House? Solar water heaters have gained massive popularity over the past decade. Why is that? This is solely because of their amazing benefits that motivate home owners to get solar pool system integration in their houses. 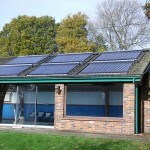 Let’s take a look at first what solar pool system integration is and later at its advantages. 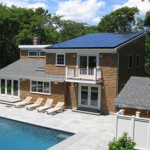 What is Solar Pool System Integration? Solar pool system integration refers to getting a solar water heating system integrated in your house. This system heats the water in your house via solar energy. It uses its solar thermal collecting device to convert the sunlight captured from the sun into the renewable energy. There are different types of solar water heaters used in houses, including the ‘closed coupled’ heaters that are quite commonly used. In this system, a storage tank, also known as the water storing tank is mounted horizontally right over the solar energy collectors placed on the house’s roof. No pumps are installed for pumping the water as the super hot automatically enters the storage tank via the thermosiphon flow. Certain people also use the ‘pump-circulated’ water heating system. It works in a manner similar to the closed coupled unit, but its storage tank is installed on the ground, below the collectors’ level. Water is moved between the collectors and the storage tank due to a water circulating pump. Solar water heating devices are amazing units. Most people regard them as a blessing and Godsend creations as they provide them with myriads of benefits, and have simplified their lives than before. Hot Water Year Around: The most important and advantageous feature of solar water heater is the provision of super hot water year around. Yes, by installing a solar water heating device in your house, you can have access to warm water 24/7 in all the 365 days of a year. This surely is a wonderful feature. This means that you don’t have to worry about getting cool water during the winters, or whenever you are in need of hot water. 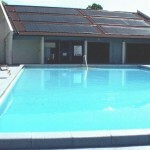 Energy Efficient: Another great feature of solar pool system integration is its energy efficiency. Solar water heaters don’t rely on electricity for heating the water, hence help you save electricity. This results in less electricity usage and is a very energy efficient method. Less Utility Bills: Due to the solar water heater’s reliance on the solar energy, it does not need any electricity or gas. This means that you will no longer be getting huge electricity or gas bills anymore, and will be saving a lot of money due to the smaller utility bills. Long Lasting: If used with care and maintained well, a solar water heater can remain in great condition for as long as 20-25 years. Due to its longevity, you don’t need to worry about getting another solar water heater or its alternative for quite a long time. 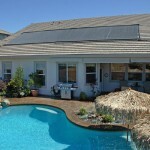 These benefits of solar pool system integration certainly make your life convenient.